Choosing the right people to carry out a project is essential to its success. When multiple projects are combined into a complex program, the “human aspect” becomes even more important. This book is the first to truly balance a complete account of the technical aspects of project and program management with a practical approach to understanding and developing the core competencies required to accomplish desired goals. 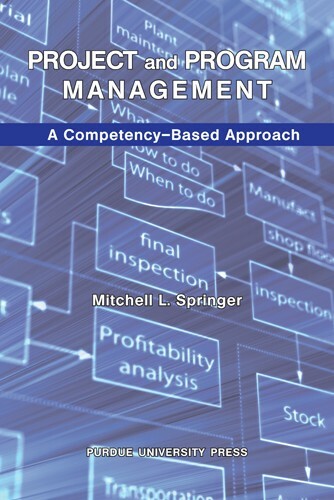 Drawing on almost thirty years of senior managerial experience in the defense and software industries, where the successful completion of multi-million dollar projects is a strategic imperative, Mitchell L. Springer has a unique understanding of both the qualitative and quantitative aspects of program management.On the technical side, this book is a complete introduction to predicting costs, setting schedules, and assessing risks. On the people side, it sheds new light on how to mold different personality types into a team, how to motivate the team’s members, and how to produce extraordinary results.After exploring the concept of “competencies” and showing how people must be at the heart of any organizational decision, Springer focuses on the essential qualities of leadership, the dynamics of teams, and the relationship between a team and the individuals that compose the team. He shows how an inclusive approach is essential to effective decision making.Using these insights, he then details the essential parts of the program management approach, describing the best way to define, organize, and schedule the work to be done, identifying risks and controlling costs during the whole process. 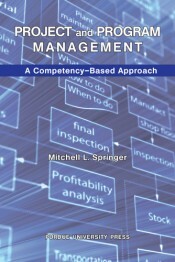 As the author of many successful books on project and program management, as an experienced practitioner, and as a renowned educator at Purdue University, one of the world’s leading centers of technological education, Springer has written a uniquely insightful and practical text that will be invaluable reading for all professionals involved in the dynamic field of project and program management. Dr. Springer currently serves as an Executive Director for Purdue University’s Polytechnic Institute located in West Lafayette, Indiana. He has over thirty-five years of theoretical and defense industry-based practical experience from four disciplines: software engineering, systems engineering, program management and human resources. Dr. Springer possesses a significant strength in pattern recognition, analyzing and improving organizational systems. He is internationally recognized and has contributed to scholarship more than 300 books, articles, presentations, editorials and reviews on software development methodologies, management, organizational change, and program management. Dr. Springer sits on many university and community boards and advisory committees. He is the recipient of numerous awards and recognitions, of recent, for diversity, equity and inclusion. Dr. Springer is the President of the Indiana Council for Continuing Education as well as the Past-Chair of the Continuing Professional Development Division of the American Society for Engineering Education. Dr. Springer received his Bachelor of Science in Computer Science from Purdue University, his MBA and Doctorate in Adult and Community Education with a Cognate in Executive Development from Ball State University. He is certified as a Project Management Professional (PMP), Senior Professional in Human Resources (SPHR & SHRM-SCP), in Alternate Dispute Resolution (ADR), and, in civil and domestic mediation. Dr. Springer is a State of Indiana Registered domestic mediator.